We run small community Yoga classes giving you the individualised instruction and care you need to further your yoga and to care for injuries. Individual or semi private yoga sessions tailored to your needs, at the time that you choose. Private lessons allow the teachers to help you refine your yoga practice working at the pace that suits you. Children need physical activity and should always be inspired to play. 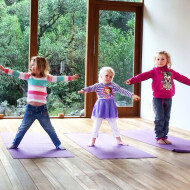 It’s essential for the healthy development of their bodies to move, stretch and challenge themselves physically.